Croc then walks into his cave for a minute. He then comes out carrying a whole king sized mattress with one hand. He places it under a small cluster of trees and turns to Morrigan, saying "This is the best I have for you, unless you wish for me to go out and steal one for you". "Oh no. This is fine." Morrigan says, pressing her hand against the mattress. It may look old & torn up, but it was soft & it was comfy to the touch for her. "Well, I guess I will leave you and your dinosaur to rest here for the night" says Croc. Though Croc doesn't know a lot about women, he knows that they probably enjoy privacy. With the two guests settled down, Croc sees no other reason to be in their presence since the two are tired. He turns around and begins to walk to his cave. Before Croc could enter his cave, Morrigan stopped him with a question. One that has been running through her mind, "Hey.....what....is your name......your real name?" she asks him, looking on as she sat on the mattress. Croc stops and stands still for a moment before he turns to look at Morrigan. "My name was Waylon Jones" answers Croc. In the back of his mind, Croc wonders why Morrigan asked for his real name, but it doesn't bother him. "Waylon Jones....." Morrigan thought as she turns to Croc again, "Well....goodnight." she says & then lays on the mattress next to Felicia. Croc doesn't respond to Morrigan, he has a feeling that she may be trying to become a friend of his. However, he has been tricked before by other people and he this thought in the back of his mind. Croc isn't the kind of "person" to take a lie laying down though; because trying to play Killer Croc as a fool will likely end in a very bad way. He turns and enters into his cave where he lays down on the ground, leaning against a rock before he eventually falls asleep. After Croc went inside his cave, Morrigan looked up in the sky & soon, went to sleep. A few hours had went by since Morrigan had went to sleep with Felicia on the mattress that Croc had given to them. As she slept, she was unaware that there was an unwelcome guest. She was sleeping awfully close to some water, meaning something was lurking in there, a predator. But this was no dinosaur, this was a living relative of the dinosaur. At 20 ft long, it slowl begins to swim where Morrigan's matrress was, but it stopped & stayed perfectlly still & waits for the right moment to strike. This.....was a Saltwater Crocodile! 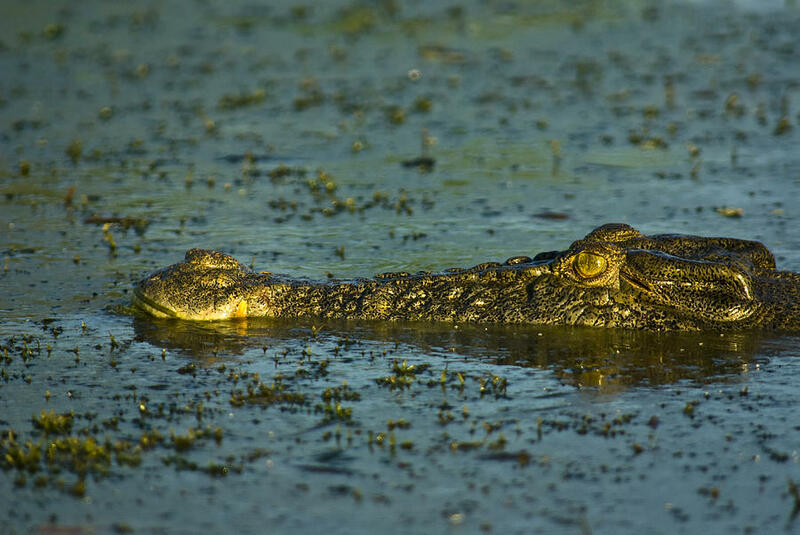 Croc is aware that saltwater crocodiles frequent the nearby waters of the river, but they usually pose no threat to him or his dinosaurs, even the smallest of his dinosaurs. And very rarely do humans come here, for if not killed by Croc or the dinosaurs...death would be found in the jaws of these living dinosaurs. The Crocodile creeps closer & closer to where Morrigan was sleeping at. She tosses & turns a bit as her foot hangs off the ege of the matress. However, it touches the water, barely! Croc is still asleep, unaware of the saltwater crocodile stalking Morrigan. However, Croc soon becomes aware that something is nearby...his keen sense of smell soon picks up the scent of the crocodile, though he hasn't awakened yet. As Morrigan was sleeping. She suddenlly felt a sharp pain in her foot! O_O Waking up, she looks down & finds that the Salty had clamped down on her foot! Putting at least 4000 lbs of jaw peeassure on her foot & begins to drag her under! She screams in both fright & pain loudlly as she tries to not be dragged under! Felicia had woke up & saw her master being attacked by the crocodile & flushed her frill forwad & attempts to spit venom out of her mouth & at the animal, but the croc shook his head viollentlly to dodge the venom, with hurts Morrigan more, luckilly, her leg wasn't broken from that head shake. Croc is awakened by the sound of screaming and quickly rises up to investigate. Upon reaching the opening of his cave, he sees that Morrigan is in grave danger. A large saltwater crocodile has grabbed Morrigan and is trying to drag her into the water. However, Croc was once an alligator wrestler, so he knows exactly what to do. He rushes in to help Morrigan and grabs the crocodile's jaws and lifts them up off of Morrigan's foot. Killer Croc vs the Saltwater Crocodile! As the crocodile was about to drag Morrigan under, he was attacked by Croc & was forced to let go of Morrigan, who quicklly swims back to the mattress with a bloody foot. Thecroc thrashes its body & tries to get free from Croc's grasp. The crocodile shakes and thrashes about to try and escape, but Croc hangs on with strength that surpasses his reptilian counterpart. Then, Croc drags the crocodile under the water; a shocking twist to the scene. Morrigan sits back on the mattress again & pulls her leg up & holds it as she saw it bleeding a bit badlly. Felica looked on, worried for her owner as the 2 turned to the water as the battle of the reptiles was taking place. The crocodile still struggles as Croc holds on him. But they've now entered it's turf, underwater! After trashing his head & tail, he somehow manages to get loose from Croc's grp as his tail smacks Croc on the side of his head & prepares himself for an underwater attack. Croc looses his grip on his reptilian counterpart, but he is just as dangerous under the water's surface as the saltwater crocodile is. He quickly propels himself at the crocodile, grabbing it by the jaws and tail. He then lifts the crocodile out of the water, holding up by the strength of his arms. The crocodile thrashes & struggles in Croc's grip as he comes out of the water! Morrigan & Felica continues to watch as Croc did this. Morrigan held on the wound on her leg as it bled, but suprisinglly not too much, but ib bled pretty good. Felica sees the crocodile again & stands in front of her owner, flashing his frill, hissing at it in protective mode. Croc still holds the crocodile firmly in his hands before saying "Anyone else I would allow my friend, but not this one". He then throws the saltwater crocodile out of his hands and away from him, Felicia, and Morrigan. The crocodile splashes into the water after being thrown. Morrigan & Felicia look on as Croc threw the salty away from them. The Croc resurfaces & looks at everyone, knowing this is too much for it. So it slips back underwater & swims off & away. Knowing that his scaly relative will not continue it's attack, Croc walks out from the dark water. He goes up to Morrigan and asks "Are you alright"? He looks down at her injury and though it isn't a terrible injury, infection is still a lingering concern. Morrigan looked on as she saw Croc approaching her. Felicia stayed beside his owner, looking at the wound. "I-I think I'm alright-. Ow!" >~< Morrigan says as she kept a hold of her foot, wich was still bleeding. With the wound still bleeding, Croc needs to stop it from bleeding or it could attract worse things than saltwater crocodiles. He tears of a bit of the mattress and wraps the torn band of mattress around her wound. "This should keep the wound from getting infected and lessen the bleeding effects" says Croc.